Sherman Douglas was the ultimate floor leader, leading Syracuse to its best three year run in school history. 'The General' was an excellent ball handler, who was a clutch scorer during the crucial moments of the game. Douglas graduated from Springarn High School in Washington D.C., the same school that Dave Bing attended. Douglas was not highly recruited, with Syracuse being the only Division I school to offer him a scholarship. As a freshman, Douglas saw limited playing time as the dynamic Pearl Washington was running the show. However, the practice time everyday against the Pearl was invaluable in Douglas’ development. Douglas had big shoes to fill his sophomore season, as the Pearl left early. Suddenly thrust early into the starting role, expectations were not very high. Everyone was wrong, as Douglas proved to be an excellent floor general and a big scorer. He led the Orangemen in scoring, and they won the Big East regular season championship. That was only the beginning, however, as the Orangemen got even hotter. Douglas played phenomenally in the Big East tournament, scoring a tournament record 35 points against Pittsburgh in the semi-finals (since broken), along with 11 assists. Syracuse would lose in the Big East finals to rival Georgetown, but not due to Douglas' efforts (he had another 20 points, 8 assists). Douglas guided the team through the NCAA tournament, and they reached the NCAA Championship game. Only a Keith Smart shot with seconds remaining spoiled the miraculous run. Douglas showed himself to be able to run the fast break as well as any player in the country. His trademark was the alley-oop pass, lobbing the ball up near the hoop as sky-walker Stevie Thompson or big men Derrick Coleman and Rony Seikaly would slam it home. Douglas would often focus on passing the ball early in the games, and then would revert to becoming a scoring during the crunch moments of the game. He was gifted at helping his teammates get the easy basket, and very good at minimizing turnovers. Full court presses against Syracuse were foolish because Douglas always seemed to break them. His junior season, the Orangemen started the season #1 in the country. They would quickly fall from the rank with a loss to North Carolina. However, behind Douglas they remained one of the top teams in the country all season long, and they would win the Big East Championship. There were high expectations in the NCAA tournament. However, Douglas was ill, and while he played against Rhode Island, his game was clearly off, and the Orangemen were upset. Douglas would lead SU to another fine season his senior year. Early in the season Syracuse had a rematch against Indiana in the preseason NIT, and Douglas would have his most memorable play. Receiving an outlet pass short of mid court, Douglas, without turning around, hiked the ball threw his legs, tossing a beautiful pass to Stevie Thompson who would dunk the ball. It was also a season of personal accolades. Douglas would become Syracuse’s all time leading scorer (later to be broken) and would become the NCAA’s all-time assist leader (again, later to be broken). He would set a Syracuse record with 22 assists against Providence on January 28, 1989. Douglas would be named to the All Big East First Team all three seasons he was a starter, and was the MVP of the 1989 Big East Tournament, despite the fact Syracuse lost the title. Douglas would be drafted by the NBA's Miami heat in the 2nd round of the 1989 draft. Though small by NBA standards at 6', Douglas would be a solid point guard for twelve seasons. His second year in the league was perhaps his best, as he averaged 18.5 points and 8.5 assists for the Miami Heat. Douglas was able to bring his famed alley-oop pass to the NBA, and succeed with it, despite the fact many critics assumed the athletic talent of defenders in the league would prevent. He showed everyone he was the unquestioned master of that pass. Douglas would lead his team to the playoffs four times (1992, 1993, 1995, and 1998), making it past the first round just one time. Overall he would play for Miami (1990-90), Boston (92-96), Milwaukee (96-97), New Jersey (98, 2000-01), and the Los Angeles Clippers (99). He retired from the league in 2001. 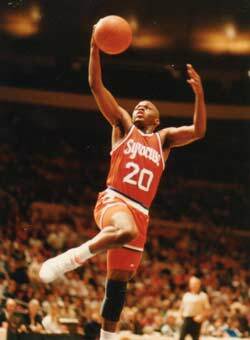 His uniform was retired by Syracuse in 2005, and he was named to the Syracuse All Century Team in 2000.